If you have more than three weeks in the North Island, you can’t skip the Coromandel. While more and more people are spending at least three weeks in New Zealand, all too often the majority of the time is spent in the South Island and people rush through the North. Which is fair enough but the North has plenty of awesome spots too. So overall, if you have at least three weeks in the North, you can’t skip the Coromandel. Narnia! I remember reading the Chronicles of Narnia growing up. But I never knew there were scenes from New Zealand in there. Travelling to destinations you’ve read in books or seen in movies is gaining in popularity, so if you’re a fan of the book it’s cool to say you’ve been to Narnia. You want to relax big time. Coromandel can be described as a series of sleepy beach towns. If you’ve been in Tauranga, it doesn’t take long upon entering the Coromandel region when the atmosphere changes. The lifestyle isn’t for everyone, but perfect for some. Hot Water Beach. This is a unique attraction in the Coromandel and possibly the only place you can see something like this worldwide. Hotel spas overlooking the ocean are one thing, but having to dig your own hot tub? That’s something entirely different and suitable for all ages. The Coromandel has 100’s of beaches with minimal visitors all around the shoreline. Too name a few, Tairua Beach, Oputere Beach, Cooks Beach, Whangamata Beach and Waihi beach. That’s more than enough to get started. Beach hopping anyone? Lacking a car. New Zealand lacks in public transport in its largest cities, let alone the Coromandel. Given this, if you don’t have a car you’re stuck with a tricky time getting around the Coromandel. The Naked Bus will stop off at a few of the popular cities a couple times each day but is relatively expensive for how far you travel. 2018 Updated: Naked Bus are no longer in business. Therefore your best bet is to look into Intercity buses or Coromandel Adventures. Hitchhiking in this area is popular, even with locals. So if you are comfortable with hitching, it’s a valid option. The area isn’t massive, so as soon as you have a car you’re away laughing. The weather is 50/50. 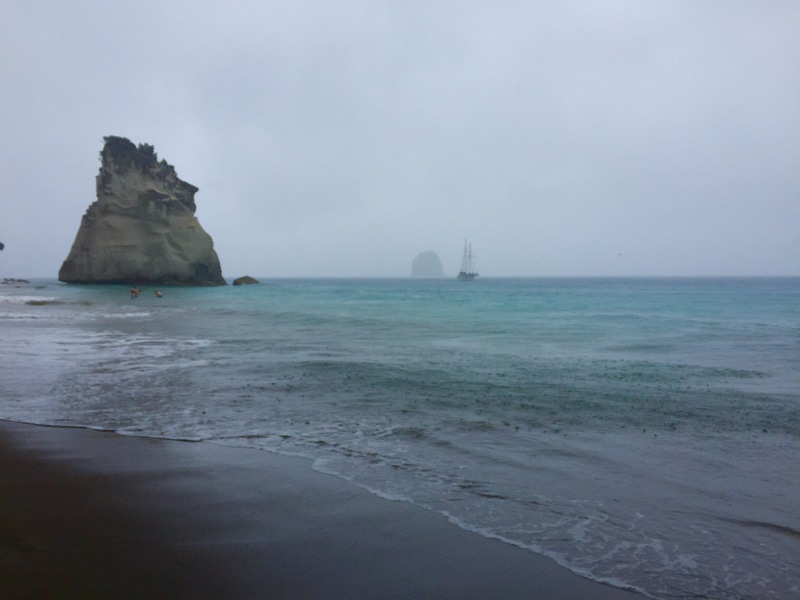 The Coromandel is all about the outdoor activities and while I went to Cathedral Cove on a rainy day and enjoyed it, a nice sunny day would have been 17x better. If you’re like most people, and rain makes you lose motivation, make sure it’s like at least 90% chance of no rain. You’re going in the wrong direction. If you’re road tripping around the North Island, the majority of people set off down the west coast from Auckland which means the Coromandel is one of the last stops. I’d say it’s best not to skip anything before the Coromandel if you run out of time. Just dream of returning to the land of the long white cloud. Is A Day Trip To The Coromandel Worth It? Another key stat I noticed when I was looking at the length of stay for visitors in New Zealand is the increase of people staying 1 – 3 days. This is due to the cheap fares being offered by JetStar and Air New Zealand (check Grab A Seat daily) in addition to Air Asia offering $109 flights between Auckland and the Gold Coast. You can see the Coromandel from Auckland City yet it takes right on four hours to travel from the Auckland Sky Tower to Fletcher Point, the furthermost away point of the peninsula. In theory that means 8 hours of driving, max, return. If you’re prepared for a long drive with all the road trip essentials you can certainly see some of the best things to do in the Coromandel. 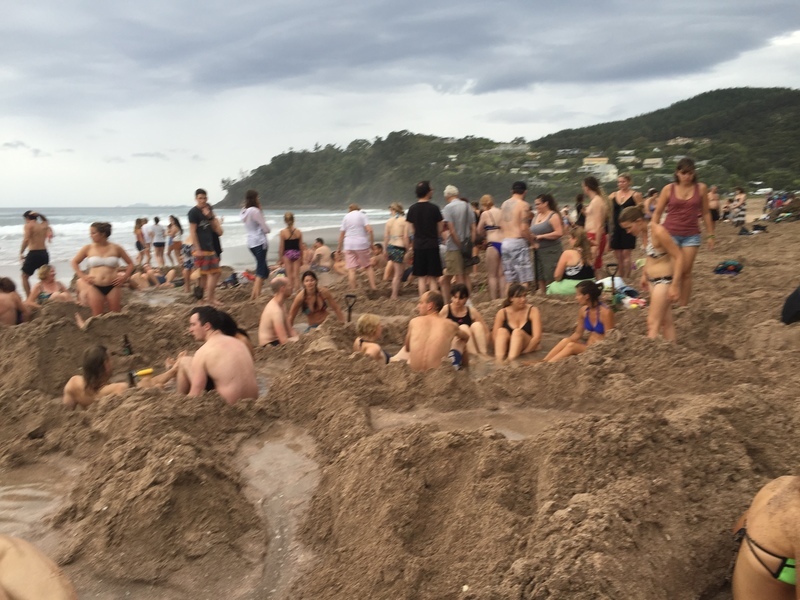 Hot Water Beach, Cathedral Cover and Whitianga Beach would make for a fun day! Conclusion: Is It Worth Visiting Coromandel? You are guaranteed at least one wow moment when you experience the Coromandel. If you’ve got a car, at least two days spare to relax and like things slowing down to an almost ‘Island time’ pace definitely head here. At worse, you can replicate some scenes from Narnia and have a laugh. The car situation really is the make or break factor in deciding to visit the Coromandel or not. Life or death, is the Coromandel worth it? No. Ouch, I said it.